Download "Westville Newsletter February 2019.doc"
Download "Westville Newsletter October 0218.doc"
1. 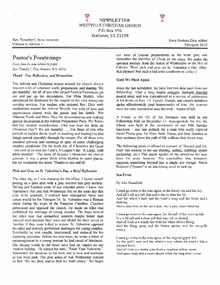 Open Communion: Communion celebrated in weekly worship is open all believers. 2. Diversity of opinion: Each person is free to determine his/her individual belief guided by the Bible, the Holy Spirit, study and prayer. 3. Baptism by immersion is our usual practice but other baptism traditions are accepted. 4. Church unity: All Christians should cooperate where possible and affirm each other as sisters and brothers in Christ. 5. The ministry of believers: Both ministers and lay persons lead in worship, direct service opportunities and nurture spiritual growth. 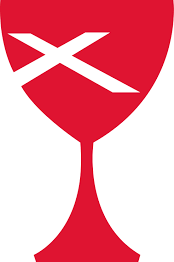 The symbol of the Christian Church Disciples of Christ is a red chalice inscribed with a white St. Andrews cross. The chalice represents the centrality of a weekly open communion to the worship experience in our denomination. The St. Andrews cross denotes the denomination's roots in the Scottish Presbyterian Church.